Durham University's Centre for Catholic Studies is the UK's first permanent centre devoted to pioneering research and teaching in Catholic theology in the public academy. The Centre operates within the UK's premier research Department of Theology and Religion and works in close partnership with the Catholic Church to produce future leaders, foster talent, and foment Catholic scholarship locally and globally. 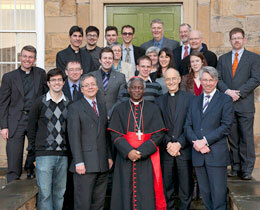 Click to access the dedicated Centre for Catholic Studies website. The Centre for Catholic Studies programme of events for 2018–2019 is available here. Dr Vincent Lloyd (Villanova University, Pennsylvania, and Alan Richardson Fellow 2019 at Durham University). Please see full details and register via eventbrite or contact us on 0191 334 1656. Prof. John McGreevy (University of Notre Dame). On Tuesday 30 April 2019 at Ushaw College. Drinks Reception: 5.30pm in the Refectory. Lecture: 6.00pm - 7.15pm in the Exhibition Hall. This lecture is open to all and is free of charge; registration is essential via eventbrite or by telephoning 0191 334 1656. Transport is also available to book for those who need it. The registration deadline for transport is 10.00am on Thursday 25 April. Professor Alison Shell (University College London). Lecture: 6.00pm - 7.15pm in the Exhibition Hall. Transport is also available to book for those who need it. The registration deadline for transport is 10.00am on Thursday 16 May. Dr Elizabeth Biggs (Lendrum Priory Library Visiting Fellow, Durham Residential Research Library). On Tuesday 18 June 2019 at Ushaw College. Drinks Reception: 5.30pm in the Refectory. Lecture: 6.00pm - 7.15pm in the Exhibition Hall. Transport is also available to book for those who need it. The registration deadline for transport is 10.00am on Thursday 13 June. We have forthcoming conferences on Catholicism, Literature and the Arts; Biblical Hebrew Poetry; Anselm of Canterbury; Libraries, Learning and Religious Identities; and Anglican-Catholic relations. Click here for details. Wednesday 12 June 2019 Durham University. Supported by The Newman Association. Sessions chaired by Carmody Grey, Chris Insole, Karen Kilby, Paul D. Murray, Anna Rowlands, and Rik Van Nieuwenhove. Registration; Durham University students and staff are free of charge, others cost is £15 per person (reduced from £25 as a result of the support of the Newman Association). £15 includes registration, buffet lunch, morning and afternoon refreshments, and 4.30pm drinks reception. Registration is essential; please register online through eventbrite by 8 May. Will be held at Ushaw College, Durham on Monday 24 and Tuesday 25 June 2019. Presentations and discussion with Ellen Davis John Goldingay, Yisca Zimran, Rev. Megan Daffern, Benjamin Sommer, Rabbi Shai Held, Katie Heffelfinger and David Firth, followed by an after-dinner poetry reading with Michael Symmons Roberts FRSL. For full conference details, including an outline programme, titles and abstracts, information on accommodation and an amenable array of conference packages, please visit the conference website. Deadline for bookings: Monday 27 May. An International Conference from Monday 8 to Wednesday 10 July 2019 in Durham. There will be a number of talks by keynote speakers and a special event including a a guest lecture by world-renowned linguist, David Crystal, readings by Maria Apichella from her award-winning collection of poetry, an exhibition and tours of the chapels, artefacts, and architecture of Augustus Pugin at Ushaw College; and a celebration of a Missa Cantata, using Mgr. Charles Newsham’s Ushaw setting. For conference details and to book, please visit our website. Deadline for registration is Sunday 9 June. All other enquiries to Theresa Phillips by email or by tel: 0191 334 3952. Registration deadline is Friday 16 August. 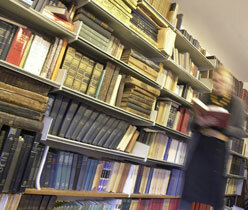 Please direct any queries to the Centre for Catholic Studies by email or on 0191 334 1656. 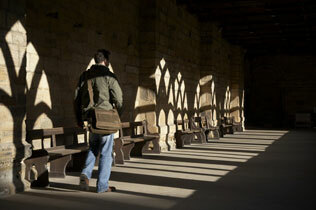 Centre for Catholic Studies email: ccs.admin@durham.ac.uk or tel: 0191 334 1656. The CCS has updated its repository of audio and video-recordings. New additions include talks by Cardinal Gianfranco Ravasi, Catherine Pepinster, Roy Hattersley, Eamon Duffy, Karen Kilby and Daniel Mulhall. They can be accessed free of charge here. Follow us on Twitter - @CCSDham.